Hot Sticks and Phasing Sticks are voltmeters on an insulated pole, usually made of fiberglass, used by electric utility workers when engaged on live-line working on energized high-voltage electric power lines, to protect them from electric shock. Depending on the tool attached to the end of the hot stick, it is possible to test for voltage, tighten nuts and bolts, apply tie wires (twisted lengths of ductile wire which fasten the running cable to its supporting insulators), open and close switches, replace fuses, lay insulating sleeves on wires, and perform various other tasks while not exposing the crew to a large risk of electric shock. 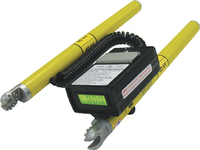 Also check our Surge generator cable fault locators!